It's a goal of mine this year to build as much of the furniture and accessories in my home as I can. Obviously, some of the large stuff needs to be left to the pros, but this jewelry hanger is so easy anyone can do it! And should! The marble adds a lovely and chic vibe for sure! If you're looking for small gift ideas for the holidays, this DIY project would be a perfect hostess gift and/or something for the chef in your life. Bonus! It will only take a few minutes to make and costs just $5. Sold? Me too. Marble is definitely the creme de la creme when it comes to countertops. But it can also break the bank when it comes to designing your kitchen or bathroom to include it. After seeing this amazing tutorial to paint MDF to look like marble, yes, PAINT it, (for $30!!!) I'm totally convinced that this is the way around the financial sacrifice. And it looks amazingly realistic that you might be able to fool even the most experienced of marble lovers. What is the one thing that I would love to have my house and everything in it covered in? Marble. And this DIY marble clipboard is the project that can help me on my way to that goal. It's my belief that everyone should have a piece of marble something in their home. Countertops, furniture, something! This is the perfect way to introduce a friend to the world of marble and it doubles as a DIY gift that takes seconds to make! The bathroom. It is sometimes the last to get a face-lift when renovations come around. And sometimes, it never gets a face-lift at all. But I'm telling you now, "BE PROUD OF YOUR BATHROOM!". 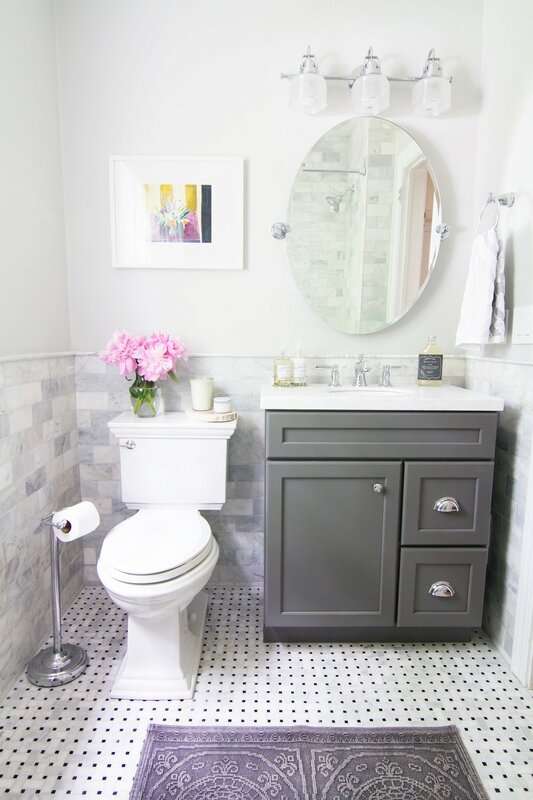 This bathroom was boring with outdated tile, tan walls, and blah wood finishes. And now? If I were the owner, this might be my favorite room in the house. October's Twin Cities Home Improvement Magazine featured a great breakdown of counter top materials, comparing their stain, heat, scratch and impact resistance in relation to the costs of each. Here's a very handy graphic to keep in mind if you're in the market.